I think Chêne was about the second Lutens scent I ever smelled, and the first one I jumped through hoops to get a bell jar of (I shipped it to a friends mums house in Switzerland, we carried it back from a Christmas visit). Now it's available at Barneys of course, which means it's less of a hoop and more of a hop.. Originally, I wrote of Chêne as being fairly linear, and it is. It starts out earthy on me with hints of rum and immortelle, then gets drier, smoky and woody. I know some loathe it, but it's really one of my favorites. Robin calls it a "sleeper" scent, forgive me for being punny, I call it a keeper scent. 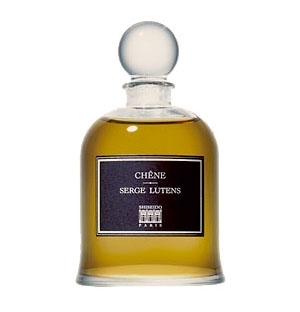 Chene is available at Barneys, among others, $140 for a 50ML bottle. My samples came from a healthy spritz from one of their bottles and from my bell jar. They smell exactly the same. I love Chene! I sleep in it quite a bit. Smoky and dark, great for wintertime. It is great for winter! I like Chene very much. In fact, I cannot think of a Serge Lutens fragrance that I don't like.....funny that, right? Chene is indeed a "sleeper/keeper" scent because it is soft yet compelling. It is a scent that smells warm, rich, and lends a gauzy cloud of atmosphere around me. There is a sense of tranquility that envelopes me because of my affinity for woody scents. It is nice that my husband enjoys it, too. I find the perfumes by Serge Lutens/Christopher Sheldrake to be masterpieces. Perhaps it is because in my early days as a perfumista when the world of fragrances was being opened to my eyes, the oeuvre of Chez Lutens was the first niche house I discovered.I was blown away by the beauty and evocative nature of this new-to-me world, and it has been a source of great satisfaction to me ever since. Thanks for your review on the Chene Perfume. I've never tried it before and now I'm compelled to go sample it.